(12:45 p.m. BST) -- It's hard to take a ship approaching its 22nd year and make it look new, but that's what Thomson Cruises has done with its newest -- and biggest -- ship TUI Discovery. The 1,830-passenger ship -- the former Royal Caribbean-owned Splendour of the Seas -- went through a six-week, multi-million- pound refurbishment to emerge as Thomson's flagship on June 9. It's a tough juggling act played by many lines launching a first in class, or in this case a radical refit of an old ship. You have to keep your loyal clientele onboard, while trying to attract new to cruise. Thomson achieves this in a number of ways with TUI Discovery. 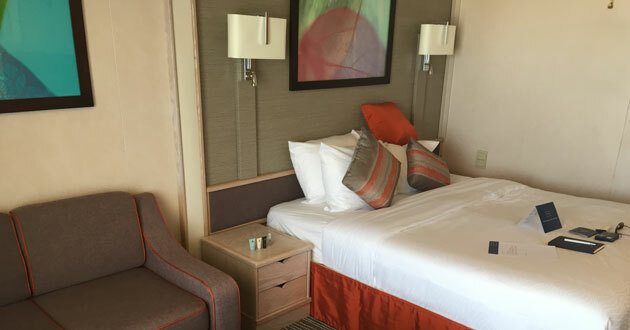 Cruise Critic was onboard (for 18 hours), and here are our first impressions. TUI Discovery brims with new technology, from the touch screens on every deck indicating where you are and what's on that day; the back-lit LED menus in Bar 11; the virtual band that plays in the Live Lounge to the hi-tech screens in the main theatre. There are just a few areas which the redesign team missed, one of which is a biggie in our view -- the showers: the fixtures and fittings are old, probably original; and they are still fitted with clingy curtains. We would have liked to have seen new taps and glass doors. This is not a word readers might associate with a Thomson ship, but be prepared to be surprised on Discovery. The decor in the public rooms is simple and elegant; primary colours in many of the lounges, including the drastically over-hauled former Casino (see below: A very British ship). In the stunning double height main dining room, 47, it's all steel, glass and centrepieces such as the grand piano on the lower level and the chandelier directly above it. Thomson has spent a lot of time on the two speciality restaurants, and it shows. 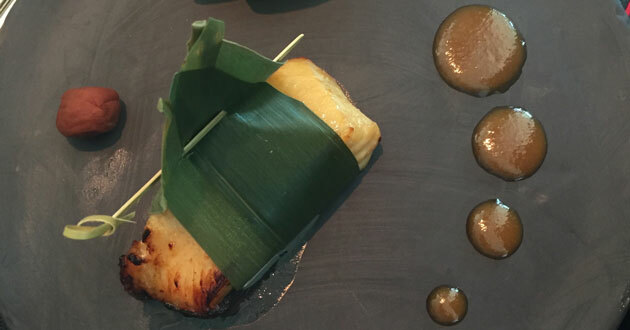 The stand-out for us was Kora La, the Pan-Asian restaurant overseen by celebrity chef Ian Pengelley. From the giant chopsticks at the entrance, to the dark wood accents on the floor and walls, to the tables all thoughtfully arranged around the outside of the space to maximise light and space, design-wise Kora La is a triumph (and we haven't even discussed the food). Similarly, cabins have all been refitted in shades of taupe and burnt orange for the furniture and walls, and oatmeal for the carpets. 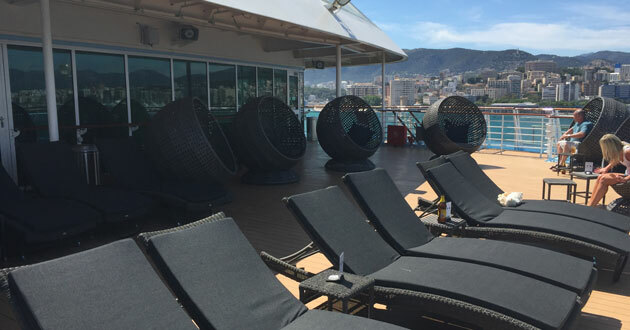 And finally the adults only area -- The Retreat -- has black rattan sun loungers, with pod-like individual chairs. 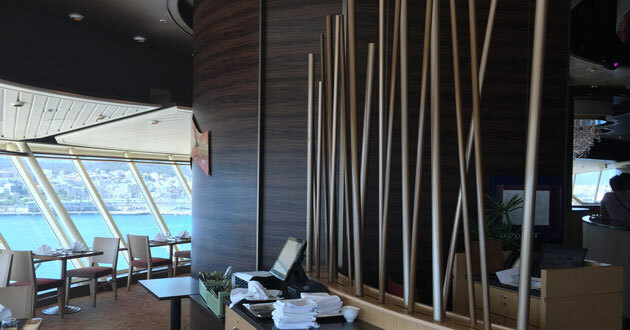 Thomson has always offered a speciality restaurant -- Kora La is popular on Thomson Dream -- but this is the first time the line has offered two dedicated restaurants, plus a 'dining experience' (Hot Stones -- also available on other ships). And in a very on-trend move, the line has also brought in a name chef to oversee Kora La -- Ian Pengelley, the man behind the new London Pan-Asian venture, House of Ho. The food here is outstanding; Pengelley has clearly added more than just his name to this venture. It's a small selection, but it includes dishes from across the region, such as duck and watermelon salad, which is exquisite; and Thai green salmon curry and Punjab-style roast chicken for the mains. And in a nod to our love of curries, there is a selection always available which you can get cooked to order and even request how spicy you'd like them. Surf and Turf, the other speciality restaurant, is an interesting one. Imported from sister line, Tui Cruises, where it is very popular with the Germans, it has been adapted for the U.K. palate, according to Thomson. Seems a no-brainer to us -- steak and seafood are cruise ship staples, and although adding this is nothing radical, it is acknowledging the fact that the modern cruiser demands choice -- whether that's in cuisine, entertainment or cabin styles. And finally, Gallery 47, the upper deck of the main dining room, though not a speciality restaurant is Italian-themed. According to Helen Caron, managing director of the line, this follows feedback from Thomson passengers when asked what one cuisine would they like to see onboard the new ship. It even includes free wine by the glass. Thomson Cruises know their passengers well (repeat bookings are some of the highest in the industry), and Discovery is a fine example of that. 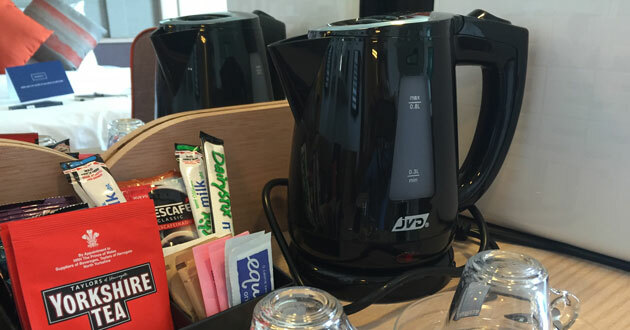 Kettles in cabins and Yorkshire tea bags. Curries on offer daily. A huge selection of beers available on tap and by the bottle in the Live Lounge (all at reasonable prices, we might add). Tips included. Wine by the glass included at meals. And despite some griping on the Cruise Critic Message Boards about the drastically reduced in size Casino, most people seem to be happy with the fact that what was an entire room given over to gambling and indoor smoking, is now a lounge for live and virtual music and dancing, and during the day, coffee and pastries. While TUI Discovery cannot compete with more modern cruise ships in terms of entertainment offerings, what it does offer is a big change for the line. 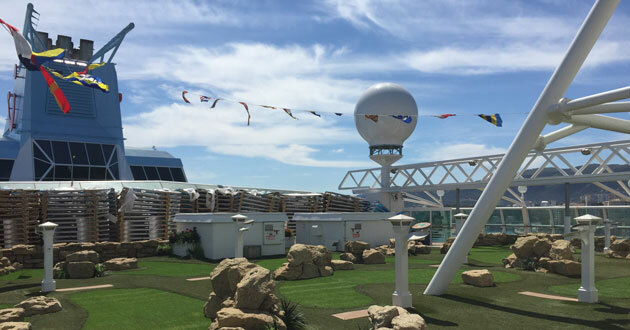 The ship boasts the line's first climbing wall and mini golf course (staples on Royal Caribbean and other U.S. lines, but a first for a U.K. line). No more end-of-the-pier stand-up comedians: The ship boasts no fewer than 11 new West End-style shows, overseen by Martyn Ford, a musical arranger and conductor who has worked with Andrew Lloyd Webber and Tim Rice. These take place in the Broadway Show Lounge, a hi-tech interactive venue. There's even an outdoor cinema screen for evening movies. The ship also features the line's first ever Breakout & Escape Room, where you team up to answer a series of clues to "break out" of the room. So what does this all mean for U.K. cruising? Well, the most interesting aspect of this new ship is the fact that just a week before its launch Thomson announced it had purchased its sister, Legend of the Seas, which will come into service next year; followed by two former TUI ships: Mein Schiff 1 and 2, all of which are a similar size and will be fitted with similar amenities, thus attracting families and possibly younger couples, too. No cruise line is better placed to try and shift the prevailing mindset about cruise in this country. With its vast network of travel agencies and agents -- all primed to covert the classic two-week holiday on the beach, to a cruise holiday. Which means that balancing act I mentioned at the start of this piece -- keeping the loyal passenger base while attracting new to cruise -- is one that Thomson is likely to pull off with TUI Discovery.